If you’re anything like my Northern friends and me, you know that winter in the South seems to be a joke. We all tend to think that their winter is like our spring or summer, when in reality it is still chilly. Though Southerners don’t have to battle the below-zero wind chills and multiple feet of snow, it is still an adjustment to move from the North to the South, especially during winter. I know for me, I came to Tennessee with very little winter things, expecting it to be warm all year round, but that’s not necessarily the case. Therefore, here is a guide of how to properly prepare for winter in the South as a Northerner. Invest in a quarter zip fleece. They’re so popular down here. Tons of sweet Southern Belles that I have met have their initials monogrammed in them. 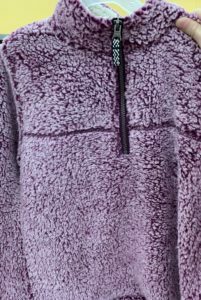 The fleeces are warm and soft, as well as super cute with the different colors. Bring your boots!! I didn’t bring many of mine and regretted it. Some of these brave souls are still wearing their Chacos in this weather, but it’s chilly. Don’t forget your hat, gloves, and heavy coat. Although it’s not as cold as up North, it is still winter and gets pretty chilly, so bring your stuff to bundle up. I didn’t go home until Thanksgiving and thought I’d be fine without my heavy coat and a scarf, but there have definitely been days when I’ve wanted them. Sweaters are big. I mean, they’re big in the North too, but they’re big here. It’s okay to bundle up. I recently saw a tweet about Northerners wanting to assert dominance over Southerners by not dressing warm, and it was so relatable. But truth is, it gets cold and it’s OK to dress warm. Nobody is going to judge you. Promise. Embrace it. For once, we’re not buried in a mountain of snow, and we’re actually able to feel our toes outside. As tough as you may want to be, make sure you take the time to enjoy this winter season and the fun fashion that can come with it while staying warm. With these tips, I hope you can enjoy this holiday season while staying warm, no matter where you may be from or what kind of winter you may be used to. Enjoy this change of scenery and make the most of this new experience of winter in Nashville. Lumination Network is Lipscomb University’s official student news service. We are a group made up of students from all majors who have a desire to submit various forms of media to be shared with the Lipscomb community. Learn More. © 2019 Lumination Network – News for Lipscomb University. Department of Communication.